Now that I’m starting to finally get back to closer to 100% health, have about 50% of my taste buds back, and having a bit more free time since I’ve been able to catch up on some work, I’ve been starting to plan out some recipes that I would like to try to make. Yesterday was a end-of-the-year picnic for my department (I’m a Ph.D. student for the readers that aren’t my mom). I had the brilliant idea to bring two things, my patented taco dip and some margarita cupcakes like the ones I made as a thank you to our neighbors (see below). I learned (the hard way) that a) one should not go to happy hour and then bake and b) I am not nearly close to a good enough baker to add to a box cake mix with from scratch ingredients. As a result, my creative juices just haven’t been flowing this weekend. This recipe is adapted from Real Simple‘s website. For the chicken, we used chicken tenders (which from our frozen aisle are like mini chicken breasts) instead of the chicken with skin on. This came out a little dry but not bad. 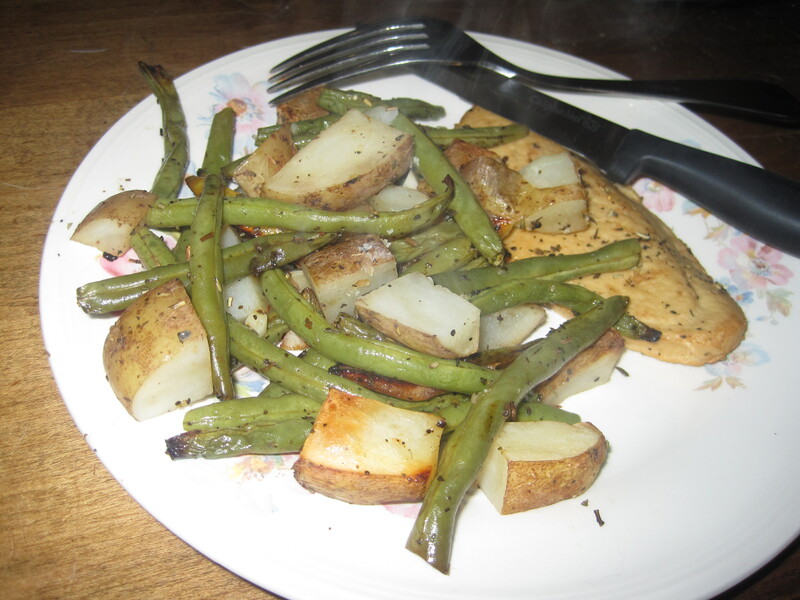 For mine, without the chicken cooking on top, the beans and potatoes did get a little dry. I had drastically reduced the oil called for in the recipe (from 6 tbsp to 1 tsp) so this might be part of the problem. In the future I might look to another component other than the vegetable stock to remedy this. Also, I still am not totally trusting the points value that comes out of the recipe builder. Like I said a few weeks ago, I discovered that if one uses all 0 point vegetables and oil a number of points magically appear. In this case, when I entered it for myself, I used 1 less lemon because the second lemon in our fridge was bad. By adding another lemon into the recipe builder it added 1 PP to the total PP value. The value I gave reflects the higher number to be on the safe side. (1) Preheat oven to 450 F. Spray a dish or skillet with cooking spray. Add lemon slices into a single layer at the bottom of the dish or skillet. (2) In a large bowl, combine the juice of one lemon (be careful how to juice this because you will use the rind in the recipe, see above), vegetable stock, oil, salt, pepper, garlic, thyme, basil, and rosemary. Mix well. Toss cut and cleaned green beans in the juice. Using tongs, take the green beans out and add to a large dish or skillet. Next, toss chopped potatoes in the liquid mixture and then move to the dish or skillet. (NOT INCLUDED IN PP calculation) If cooking with chicken (or a soy substitute) toss this in liquid and then add on top of beans and potatoes with remaining liquid. (3) (IF COOKING WITH CHICKEN) Roast for 50 minutes. Remove chicken from dish or skillet and cook for 10 minutes more or until potatoes are tender. (IF COOKING WITH SOY MEAT SUBSTITUTE) Roast beans and potatoes for 40 minutes while marinating the soy substitute in the liquid. Add soy meat substitute on top of beans and potatoes and roast for an addition 20 minutes or until potatoes are tender.